Want to make your own scented, layered jar candles? Want to do it, using items you already have on hand..? Practically for free..? I have a little problem…. you know those candles you buy that smell amazing, but the wick burns down through the middle of them and you’re left with a bunch of (fragrant) wax? Those candles? Yeah. I can’t throw them out. I know I can’t burn them anymore, but they’re usually expensive and the thought of throwing away all of that expensive wax makes me cranky. I won’t say that I’m a hoarder, per se, but I do have quite a little collection going, because I know I can melt that wax and make another candle out of it. It’s easy, it’s practically free, and it only takes about 30 minutes. Gather up your empty, burned down candles and a clean jar. Boil a little water and hold the jar with the candle wax in the water until you can see that it’s melting just a little. You don’t want to melt it, you just want to soften it up a bit so that you can cut it into chunks while in the jar and get it into the bowls you’ll be using when you melt the wax. 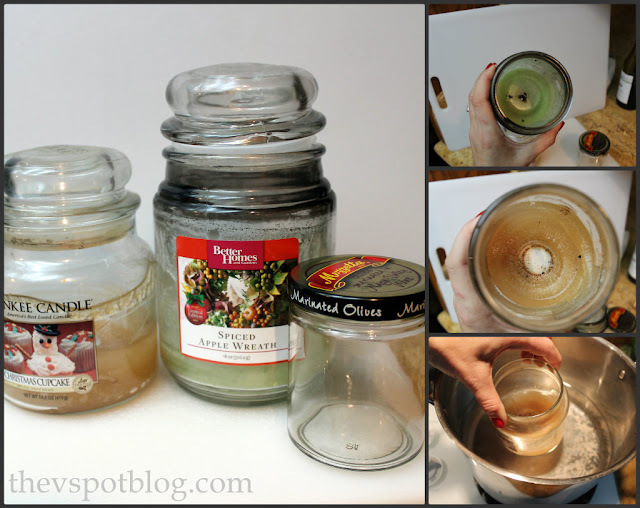 If you melt the wax in the existing jar, you get all of the soot and smutchz with it too. No thanks for that. Put the different waxes into separate bowls and melt it in the microwave. Treat it like chocolate chips… microwave for a minute or two, then stir, keep repeating until the wax is melted. There will probably be a little bit of soot or debris in the melted wax, but it will sink to the bottom of the bowl. Prepare your glass jar with a wick. You can get these at any craft store. 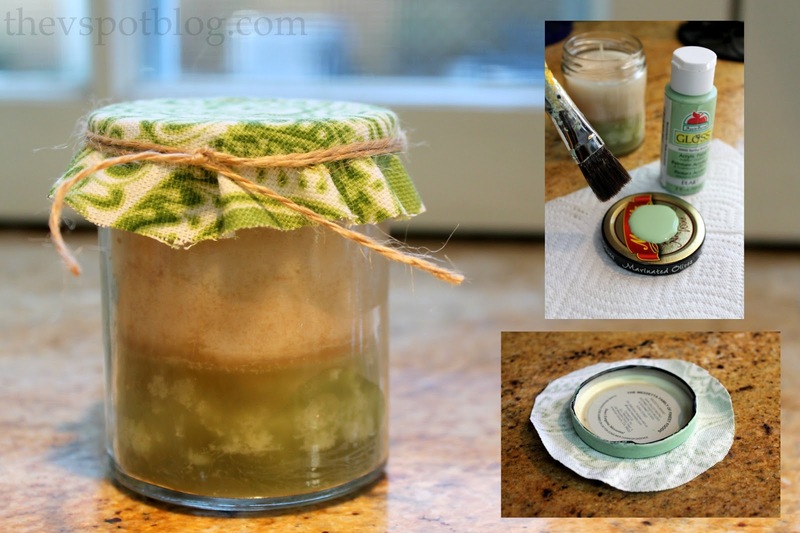 Carefully and slowly pour one color of the wax into the jar. (Any yuck or debris should stick to the bowl as you pour.) Let the wax set up, then pour the second layer. For the lid, you can do any number of things to it. Paint it, Mod Podge pretty paper or fabric on it, or just cover it with a circle of fabric and pretend it’s a jar of jam. I am going to consider some candle making as part of my January clean-up. 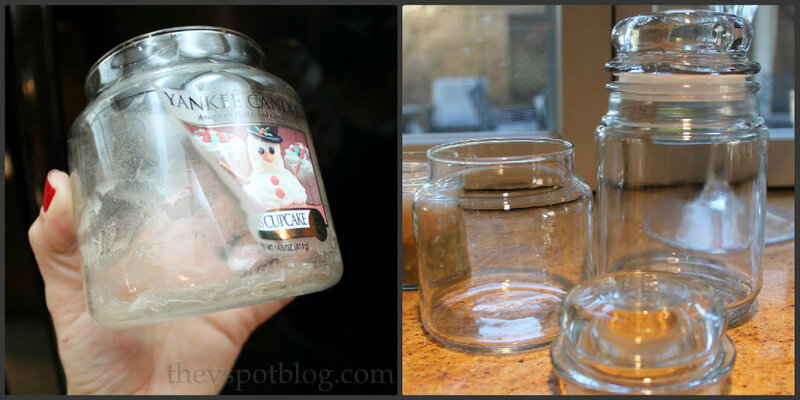 I have to get rid of all of those empty candle jars. By the way, I clean out the empty jars too. They’re fun for storage, or making more candles. These are fun to make just for yourself, but they make great little gifts too. How about you…? Going to give this a try? It’s nice to give an expensive candle a second life. Awesome idea~and definitely perfect for gifts!! Love this! 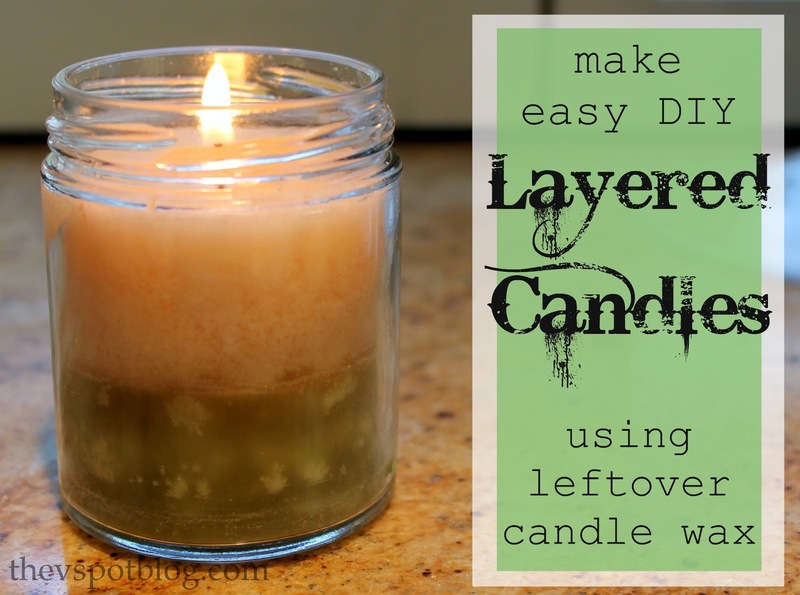 I have the same problem… tons of leftover candles!